Light water reactors (LWRs) are the predominant class of nuclear power reactors in operation today; however, ageing and degradation can influence both their performance and lifetime. Knowledge of these factors is therefore critical to safe, continuous operation. 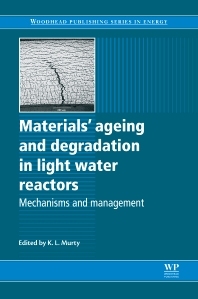 Materials ageing and degradation in light water reactors provides a comprehensive guide to prevalent deterioration mechanisms, and the approaches used to handle their effects. Part one introduces fundamental ageing issues and degradation mechanisms. Beginning with an overview of ageing and degradation issues in LWRs, the book goes on to discuss corrosion in pressurized water reactors and creep deformation of materials in LWRs. Part two then considers materials’ ageing and degradation in specific LWR components. Applications of zirconium alloys in LWRs are discussed, along with the ageing of electric cables. Materials management strategies for LWRs are then the focus of part three. Materials management strategies for pressurized water reactors and VVER reactors are considered before the book concludes with a discussion of materials-related problems faced by LWR operators and corresponding research needs. With its distinguished editor and international team of expert contributors, Materials ageing and degradation in light water reactors is an authoritative review for anyone requiring an understanding of the performance and durability of this type of nuclear power plant, including plant operators and managers, nuclear metallurgists, governmental and regulatory safety bodies, and researchers, scientists and academics working in this area.